This is a fun private investigator romp. With a wink and a nod to Charlie’s Angels, three female private investigators head up an agency run by a slightly mysterious older man. The first story focuses on Taryn. She’s a former professional cheerleader, a bitter divorcee, and a terrifying driver. She works with Rick, a gorgeous DEA agent, to find the con man who swindled his mother. Fans of Janet Evanovich’s Stephanie Plum stories will recognise the slapstick, silly humour and will love this author’s sense of the ridiculous. A cast of zany characters surround Rick and Taryn and I really loved the author’s imagination. From peeping Tom frat boy neighbours to the hitman houseguest receiving anger management therapy, this story is full of delightful, unexpected moments and characters. I’m sure serious mystery lovers will pick holes in the plot, but the charm of this story is the characters and relationships. Taryn is a little bit insane but always fun and her approach to crime solving is slightly unorthodox. There is some heat between Taryn and Rick, but also friendship and humour. There are a couple of slightly steamy scenes (including one in a dumpster), but all Rick and Taryn’s intimate moments tastefully fade to grey. This is a fabulous, light-hearted antidote to the dark and gloomy Scandi noir trend in mystery writing. The author has set the scene for a great series and I’m already looking forward to the next book. This is a fun read, with a strong nod to a certain billionaire and his three beautiful angel detectives. I am looking forward to getting all the girls' stories! The pace is fast, the chemistry is energetically heated, and the plot is fun. It made for a good read on many levels – as a mystery, as a gaining redress for women scorned, and a feisty romance. There are crazy student neighbours; the arrival of Aaron and his cooking abilities; let alone the mad woman and her sons...jammed packed with fabulously silly events. It would be difficult not to laugh and enjoy this mad romp of a book. I like how the issue of location and future was dealt with, and though it was in essence sweet, it wasn't too syrupy. I am definitely looking out for the next installment. 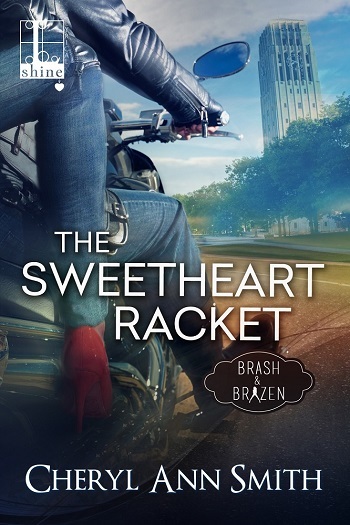 Reviewers on the Wicked Reads Review Team were provided a free copy of The Sweetheart Racket (Brash & Brazen #1) by Cheryl Ann Smith to read and review.